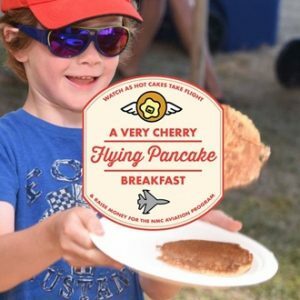 Support a good cause and enjoy a flipping good time as Chris Cake’s pancakes soar through the air in support of the Kevin Copeland Memorial Scholarship. Top your cakes with Herkner’s Cherry Topping & Out of the Woods Maple Syrup at this National Cherry Festival event sponsored by Molon Excavating. Kevin Copeland was a graduate of NMC’s Aviation program and an NMC aviation instructor. He competed and flew in airshows all over the region, including the National Cherry Festival. At the time of his death last July, Kevin was an aircraft captain with Air Services, Inc. Friends, colleagues, and family members created the Kevin Copeland Memorial Scholarship in memory of his life and love of flying to inspire other students with a similar passion.